Released as Crazy Cars 2 in Europe. You are at the wheel of the fabulous Ferrari F40, in a race against time. As you go tearing through four states in search of the quickest way to accomplish your mission, you will have problems with the policemen who don't appreciate the sight of a Ferrari F40 crossing their state at 200 miles per hour. 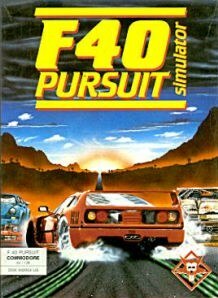 Your Ferrari features the latest radar, enabling you to detect police road blocks, With 360 degree spins, car chases, realistic 3-D road junctions, hills, road blocks, real mapped byways, and not to mention superb graphics, F40 Pursuit Simulator is here to set new standards in road racing. Take a test drive today.